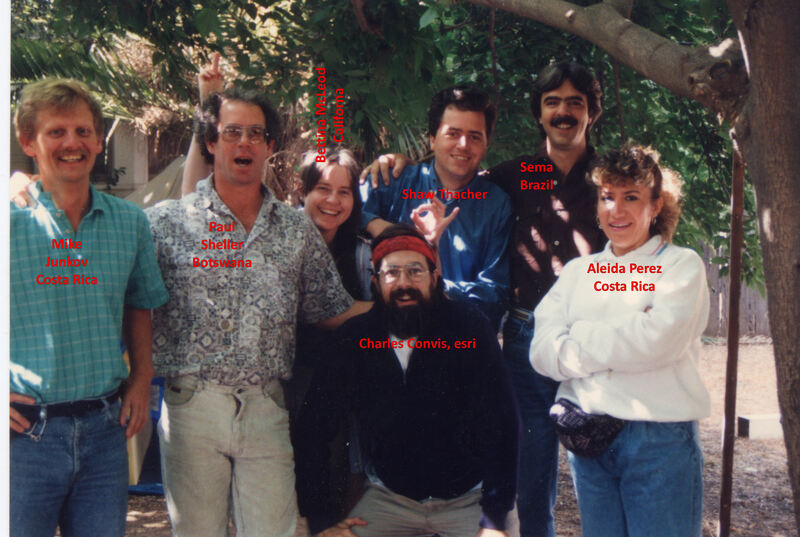 1991 was the first year of a program devoted to Conservation at the Esri International User Conference. Airfares to Palm Springs were expensive for most nonprofit groups, however there was a significant discount at the time if you could include a saturday night stayover, so we arranged to provide camping at the Convis house for anyone wanting to arrive on friday or saturday so they could get the cheaper tickets. 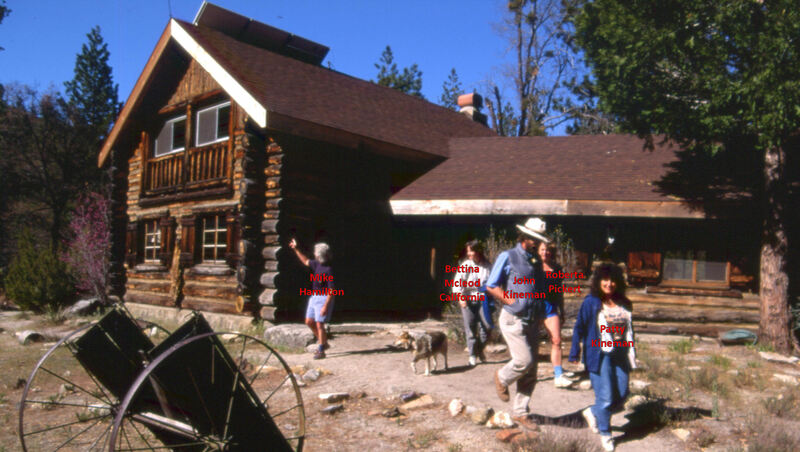 This was also the first year that Dr. Mike Hamilton offered the use of the James Research Reserve for free accomodation for conservationists attending the Palm Springs Conference. The James Reserve saw about 5 residents that first year, and Shaw Thacher, one of the first scholarship recipients, details what it was like in his report below.
" Intro to Conservation ESRI Style P. Shaw Thacher, Jr. I was the anonymous conservation attendee at the recent Palm Springs User Conference; my name, printed on the conference badge had no identifying organization or institution beneath it. Despite the fact that my badge generated numerous double glances from other participants, who were all amply 'labelled,' I felt fortunate to have attended, in part because I was following the conference with three weeks training in Redlands. Appropriately, my passage was the 'parfait' introduction to Arc/Info. However, it turned out to be much more than that. ESRI's sponsorship of conservation programs worldwide was showcased for the first time at the conference; impeccable timing for a recently graduated Columbia University student who readily professes an environmental bend and had previously performed climate related research at NASA's Goddard Institute of Space Studies. My purpose at the conference, aside from as absorbing (osmotically) as much Arc/Info and GIS information possible, was to get a sense of where and to whom I would send resumes and cover letters post ESRI training. With growth trends of GIS use what they are, I was optimistic about subsequent employment potential. My lodging was arranged by Charles Convis who was undoubtedly the conference's conservation 'Maestro, Orchestrator and Guru.' I was placed with a large and motley handful of conservation participants at James San Jacinto Mountains Reserve located SWW of Palm Springs. Michael Hamilton, the Reserve's Director, had offered his research center's empty bunk beds for the ESRI conservation groups, or rather, for those whose organizations could not afford Palm Springs. At the lodge itself Michael Flaxman and his wife (who put together the multi-media display of the reserve's resources with M. Hamilton) greeted weary travellers arriving from Costa Rica, Brazil, Botswana, Northern California and New York City. They explained that we were the only current residents except for two University of California owl researchers who might trudge outside at three or four in the morning. This setting was, needless to say, idyllic. I was more than happy to chauffeur the conservation 'others' to and from Palm Springs and nighttime temperatures dropped to comfortable low forties, contributing to the length of our late evening discussions. The conference itself was frustrating in a great way: there was far too much choose from. Which lectures, discussions and groups meetings doth one attend (especially when one's purpose was as unnarrowed as my own)? Somehow I emerged relatively unscathed from the decision making process, having picked the apple courses (Introductory and Educational for non-attendee readers) and a smattering of conservation, Digital Chart of the World and modelling offerings. It should be noted that highlighters are a must to reduce the selection of available and conflicting seminars (an unpleasant task) and that switching between lectures is permissible, though quietly. My apologies to any instructors and/or lecturers who may have taken offense at departures, and now to those readers who have not partaken in a Palm Spring's User Conference. Of the many conservation participants I met (which categorically leaves unmentioned the non-conserve-attendees from Dept.of Defense, US Geological Survey, US Bureau of Indian Affairs and many, many others that I talked and lunched with) five also stayed on for training: Michael Junkov, a danish forester and Aleda Perez with IUCN/ORCA - Costa Rica; Sergei Mauro Santos Filho of Brazil's CEDI (Ecumenical Center for Documentation and Information which defends the rights of indigenous peoples); Tsareni Bwana of the Kenya Wildlife Service and Paul Sheller of the Kalahari Conservation Society of Botswana (accompanying article). We moved our sleeping bags from James Reserve into the Convis' backyard and set up desert cots beneath the stars. 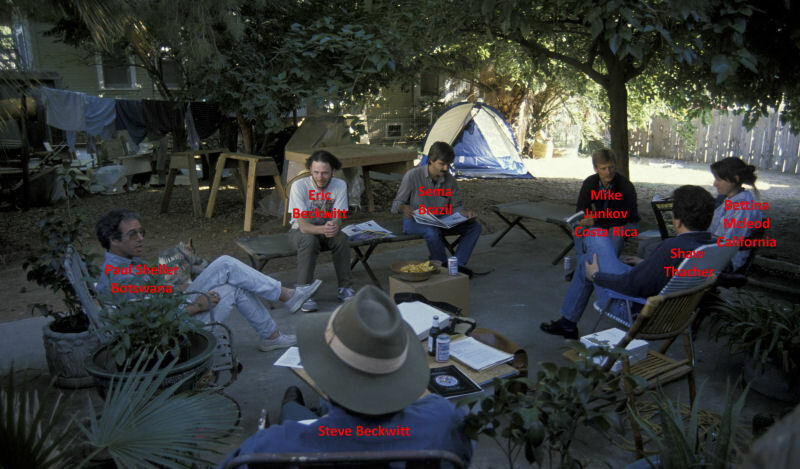 The 'others' stayed in Redlands for either one or two weeks training and then flew home or followed up on hardware donations they had sought at the User Conference from companies such as Sun, Hewlett Packard, Trimble, Calcomp, etc. This was their brief and perhaps single window of opportunity to pitch their needs and to secure commitments that could be followed up from abroad. During training I observed, thought through my options and conversed extensively with our now close knit conservation group. Three days before Paul Sheller departed I offered the Kalahari Conservation Society (KCS) whatever services I might provide. My argument in favor of working for KCS was threefold: (1) I had lived in Kenya, a thousand miles to the north as a teen and am familiar with Africa; (2) KCS would be launching their GIS from ground up which meant I would participate at all stages (thus would avoid becoming a specialist) and hence gather a broader view and experience of problems inherent to developing a GIS in non-supportive environments; and (3) his project, once the Training Institute is organized, represents a fundamentally different approach for getting GIS technology into an African country and/or government (current efforts are more 'top' down, such as the UNITAR (training and research division of the United Nations) GIS efforts in Nairobi. He readily accepted my offer and we had time to talk about what had to be done in terms of fundraising, logistical planning and hardware support. A unique human resource that became available for KCS as Paul attended the conference came from Dutchess County, New York. Roberta Pickett, who in her words had been 'mother and midwife' to Dutchess County's GIS offered Paul her services to clean and build the dozen or more maps that ESRI had scanned for him; on Her Own Time! This was certainly a generous offer. When she found out that I had been 'enlisted,' she parlayed her supervisor into creating an internship position so that my training could be implemented stateside - processing Paul's maps and working on Dutchess County projects. This was clearly ideal and answered previous concerns that I would be one of two trained but 'green' Arc/Info operators trying to build a GIS in the Kalahari Desert and Okovango Delta. Needless to say I again felt very excited and very, very fortunate - fate was operating on my behalf. Through my involvement at the User's Conference and subsequent training I developed a strong sense of ESRI's vital role with conservation groups worldwide. At the Conference the Conservation Users Special Interest Group was formally announced, consisting of local and international conservation organizations, GIS hardware and software manufacturers, large GIS users interested in supporting conservation programs, and donor foundations. This SIG has developed to support the acquisition and education of GIS tools and methods by conservation groups. My current role with KCS has evolved within the philosophy of the SIG. While ESRI initiated the 'software' sponsorship of KCS, it has been matched with hardware and human resource contributions, i.e., Roberta Pickett in Dutchess county. Each element is crucial yet the software, hardware and training would normally not be available, affordable or accessible for small underfunded conservation organizations. The role of worldwide conservation organizations are crucial, serving the interests of present and future generations through sustainable development. Finally it is important to underscore the fact that every Arcnews reader can potentially become involved or contribute to the Conservation SIG. Orchestrating crucial hardware donations need not depend solely upon hardware companies; machines that become obsolete through the upgrade process from PC Arc/Info to workstations, would be perfectly matched for conservation groups just beginning their GIS odyssey. Creating four to six month internship positions to help implement ESRI's training would also play a crucial role. Taking a GIS 'vacation' would be another way to contribute. The knowledge and technological know- how contained by the readers of Arcnews is itself an enormous human resource. Becoming involved whether by simply responding to this article with your ideas or through some form of deeper commitment will prove itself rewarding and beneficial for all. We welcome your ideas and indeed solicit your responses c/o Charles Convis, ESRI. " Keynote Address: A Realistic Basis for Conserving Tropical Forests: Time or Space? Influencing Public Policy for Conservation using a GIS(?). Use of a GIS to protect wildlife at the Kenya Wildlife Service. A Pilot Program: Application of Arc/INFO and ERDAS Geographical Information Systems to Biological DIversity Conservation in the Sierra Nevada, California. National Government versus Local Conservation Priorities: The Role of GIS. Title: Elephant Population Estimates for the Central African Forests. Title: A Realistic Basis for Conserving Tropical Forests - Time or Space? Title: Conservation Gap Analysis of California Biodiversity. Title: Linking Spatial Data to a Model of Colonization and Deforestation in Rondonia, Brazil. Title: Where to Focus Biodiversity Conservation Efforts: Using Bird Distributions in a GIS to Map Hotspots. Title: Developing a GIS Database for Park Management in the Virunga Volcanoes National Parks of Rwanda, Uganda and Zaire. Organization: Zambian Natn'l Parks and Wildlife Dept. Title: A Drum Beat Away from Arc/INFO's role in Africa's Land Use Planning. Title: Monitoring Ancient Forests in Northwestern USA - GIS Methods and Results. Title: Asessing the Global Status of Temperate Rain Forests Through Development of Integrated Regional and Local GIS Databases. Title: The Effect of Landscape Changes on the Spatial Distribution of Birds- A GIS Application. Title: Development and Analysis of a Riparian Forest Freagmentation Model.